One of my favorite dessert/snacks is the Cream Puff or Profiterole if you want to get technical. It's not heavy or rich, but delectably satisfying. My parents used to always get the pre-packaged ones from Costco, which I thought were pretty awesome. So I knew that making them from scratch would be that much better and more rewarding. It's just a good recipe to have in your back pocket. It doesn't take long too whip up and they're very versatile so everyone's happy in the end. I linked up with SWEET AS SUGAR COOKIE'S "Sweets for a Saturday" Link Party. Over medium-high heat bring water and butter to a boil. Slowly add flour while continuously stirring until mixture forms into a ball. Let stand until almost completely cool (5 minutes). Add eggs one at a time mixing well in between each. Place tablespoon amounts of dough onto baking sheet leaving some space between each drop. Bake for 20-25 minutes until medium golden brown. 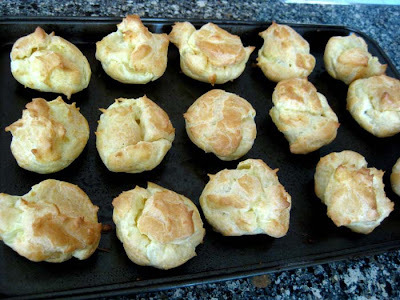 The centers of the puffs should be dry. By all means, if you can make vanilla pudding and/or whipped cream from scratch, do so! It'll be even more delicious, but these store bough alternatives are pretty darn delicious as well and will save you time! Fill zip lock bag with filling. Cut one of the bottom tips of the bag. Like squeezing out toothpaste, slowly fill puffs with cream. I served mine with some melted chocolate drizzled on top, but these are perfectly delicious as is. Oh, these look sinfully good! I've just been tasked with making our Christmas dessert so I may have to try these! My Grandma used to make these for us all the time! 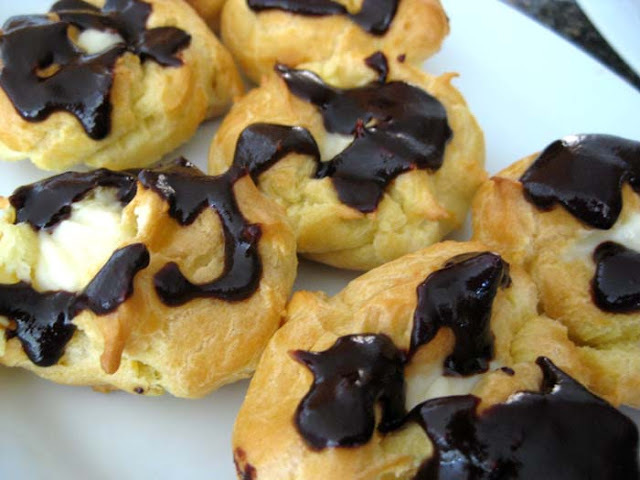 Just like this with vanilla pudding inside and chocolate drizzled over top. So scrumptious! I almost forgot to include this on my Christmas Sweet Goodies table ! =) thanks for reminding ..
interesting posts with nice presentation.. THESE LOOK SUPER TASTY.... GREAT BLOG!!!!!! i'm following you now follow back?? ?